T cell infiltration of colorectal cancer is associated with improved clinical outcome, underlining the importance of the immune system in cancer control; however, immune checkpoints, including the inhibitory T cell molecules CTLA-4 and PD-1 that temper the native immune response, mitigating autoimmunity, are coopted by tumors to facilitate escape from immune surveillance. Blockade of CTLA-4 and PD-1 and its ligand PD-L1, expressed by many tumors, have shown impressive activity in melanoma, renal cell carcinoma, and lung cancer. 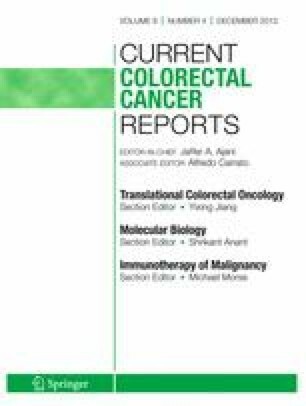 Immune checkpoint inhibition has been less well studied in colorectal cancer, but preclinical and clinical investigations are in progress. Sandip P. Patel declares that he has no conflict of interest. Takuya Osada declares that he has no conflict of interest. Koya Osada declares that he has no conflict of interest. Herbert Hurwitz has received compensation for service as a consultant and is supported by grants from Roche, Genentech, Bristol-Myers Squibb, Sanofi-Aventis, Amgen, Regeneron, Novartis, TRACON, and Threshold Pharmaceuticals. H. Kim Lyerly declares that he has no conflict of interest. Michael A. Morse is supported be a grant from Bristol-Myers Squibb, and has received payment for lectures including service on speakers bureaus from Genentech.